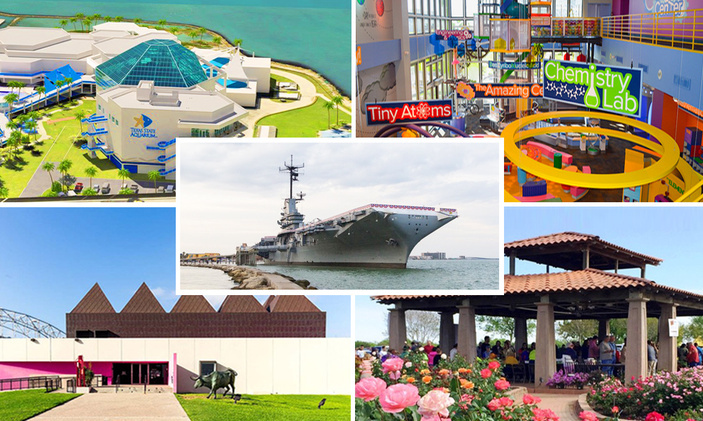 Five major attractions in Corpus Christi have partnered to offer half-price admission to members of any one its fellow destinations. Offer is good throughout the month of February. Members of any of five major attractions in Corpus Christi can get into any venue for half-price during the month of February. Members also receive 10 percent off gift shop purchases at all five. The Texas State Aquarium, Corpus Christi Museum of Science and History, South Texas Botanical Gardens and Nature Center, Art Museum of South Texas, and the USS Lexington Museum on the Bay have joined together to offer their members this special benefit during one of the year’s dreariest months. It is certainly the perfect time to view the aquarium’s latest new 4D film, “BBC Plant Earth: Ice Worlds 4D.” Shown in the Whataburger 4D theater, the 12-minute film explores the mysterious frozen worlds of the Arctic and Antarctica. Screenings are free with admission. If you are not a member already, you can go ahead and become one at any attraction of your choice at a 10 percent discount this month only. The attraction partnership is designed to give residents and frequent visitors an opportunity to explore hometown visitor destinations just like the tourists. February is a great month to visit the attraction of your choice — or all five!